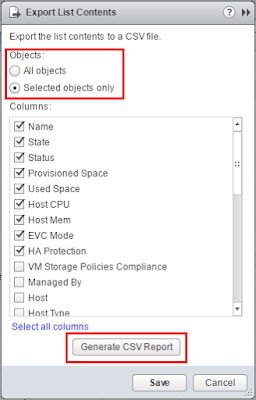 Techies Sphere: Multiple ways of exporting Virtual Machines list to a file - VMware! 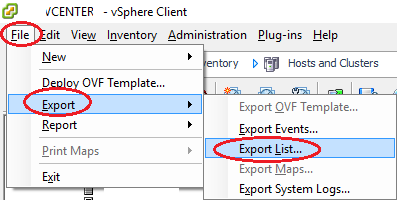 Multiple ways of exporting Virtual Machines list to a file - VMware! Or, How to export the list of all VMware Virtual Machines? Or, Export all Virtual Machines to an excel, csv or text file. There are number of ways to export the list of Virtual Machines to an Excel or Text file. I am going to show you the few easiest methods of doing this. If you love GUI, you can use VMware vSphere Traditional Client or VMware vSphere Web Client and if you are a command line lover, you can use VMware vSphere PowerCLI. Give a friendly File name > Choose a File Type and Save the files at desired folder path. Login to VMware vSphere Web Client > Go to your Cluster > Go to Virtual Machines Tab > Scroll down the window till bottom of the vSphere page > Click on the arrow sign as highlighted in the below screenshot. Select one or multiple objects or select all objects depending on your requirements > Click on “Generate CSV Report” > Wait for “Save” button to be highlighted > Click on Save and Save the report at desired destination path. Open VMware vSphere PowerCLI > Connect with your vCenter Server >Once connected, on the command prompt type Get-VM | Export-Csv -path "d:\test.csv" > Press Enter to execute the command > Wait for the command to be completed successfully > Go to your destination folder path, here should be having your VMs inventory in a CSV file. Note: - You can change the destination path to any convenient path you need. In my case, I have taken it as D:\ drive and file name is test.csv. Thanks a lot for your feedback...Readers like you always encourage TechiesSphere to write more unique, relevant and useful informative articles.. Lets stay connected for more knowledge sharing stuffs..
Hey, Thanks for writing in.. This must there still.. Navigate through of the cluster and see if the export button/icon is available there.. 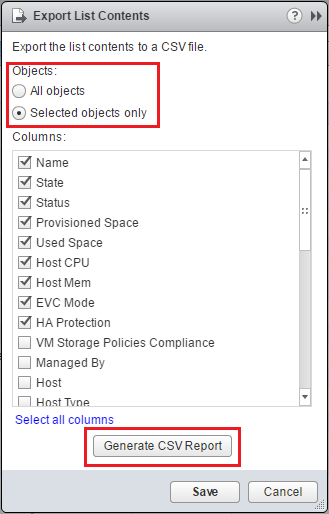 If still not sure how to find it, refer the screenshot in this article or provide me your cluster's screenshot with Virtual machine tab selection.. I may be able to help you then..